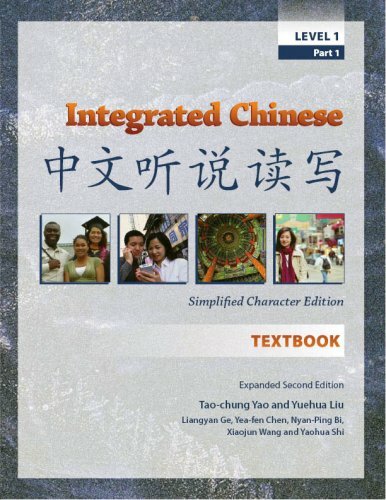 Integrated Chinese 1 (中文聽說讀寫一) is by far the most used introductory Chinese textbook at US colleges. In fact, it was with this book that I began my studies of Chinese as a college freshman. According to the preface, Integrated Chinese uses a modern communicative approach. The book covers about 800 characters, not counting supplementary vocabulary, and is meant to be used for one college school year in a five hour per week class. I’ve never seen the book sold in Asia. Like most Chinese textbooks, each lesson of Integrated Chinese 1 includes a Chinese dialogue, the same dialogue repeated in pinyin and then English, a vocabulary list, and a grammar section. In my opinion, the approach really isn’t that communicative. It’s just as focused on grammar and translation as any of the old school Chinese texts, such as the Practical Audio-Visual Chinese (視聽華語) series. It certainly isn’t as communicative as the modern Japanese textbooks, such as the Yookoso series. Integrated Chinese is extremely well laid out, though. The dialogues really are useful as spring-boards into class discussion. I think this is the one place where the communicative intent of the authors comes through. Integrated Chinese 1 is accompanied by a workbook, a character workbook, and CDs with workbook exercises. Both simplified and traditional character versions are available. I found the workbooks to be difficult, but extremely helpful. The workbook CDs are absolutely the best I’ve ever used in any language program. For that matter, I can’t think of a single better workbook for any language course. Maybe the most telling thing is the comparison I saw the first time I left Taiwan to visit home. I met up with some friends studying Chinese in college with the Integrated Chinese series. In 9 months of attending class for 1 hour a day, they knew more characters and had better pronunciation than my friends at Shida (師範大學), who had been living in Taiwan and using the Audio-Visual series for 2 hours of class a day over just as many months. Nearly all of them credited the listening homework sections in the workbook. I can’t emphasize enough how every thing in Integrated Chinese 1 is useful once you get to China. If you go to Taiwan, like I did, you’ll find a few word usages are different but you’ll still be well understood. Unfortunately, at times the book seems more like it was written for linguists than for 18 year old college students. The phonics section at the beginning was particularly intimidating. I remember that it described the pinyin “x” sound as an “alveolo-palatal fricative”. I had to look up each word in the dictionary to figure out what that meant. On the other hand, the book was very precise and I did figure it out, unlike many people I’ve met who have studied for years and still don’t differentiate their “x” and “sh” sounds very well. The grammar explanations are dry, but thorough. One final thing I’d like to say about Integrated Chinese 1 is that it is NOT an easy textbook work through in the time frame allotted by most colleges. If you work through it in one year in a 5-credit class, I guarantee you’ll be spending at least a couple of hours a day on your homework. UC Berkley has some multimedia excercises for Integrated Chinese. I hated using this text. I brought up many of these same concerns in a review U wrote for the Journal of Chinese Language Teachers. John has a version of it up on Sinosplice. Back when I was in the class you and Zhou Laoshi were teaching at the University of Colorado, it was stressful memorizing so much vocabulary every week. I read your review at Sinosplice. What you said about students only being able to retain so much vocabulary long enough to take the tests was DEFINITELY true in my case. The book worked ok for Dan, but he was putting in 3 hours a day, and I think students like him would do well with any text. Still, Integrated Chinese beats the heck out of the Audio-Visual series so popular here. What I’d really like to know is, are there any introductory Chinese textbooks that you recommend? P.S. Is your review from CU ok to put up here on my blog, too? sure, feel free to post the review here; like I told John, use it any way you see fit, with due acknowledgement of course. I read with interest what you wrote about your friends at Shida, and how their pronunciation isn’t as good as those in the US using the IC series. I started learning Chinese there way back in the day. I have to wonder about that unless you mean: 1) they are picking up too extreme of a Taiwan accent, or 2) they are associating almost solely with other foreigners after class. I studied there three months, and when I got back to the US they put me in 3rd Year. To be honest, what you did has done my heart good. I always tried to stress to students that in order to really learn Chinese, they had to go live there. I’m glad you did that. I tried to get the department to require a minimum of one year overseas study for Chinese majors, but they nixed it. To answer your question, I’ve never found a suitable Chinese text that uses the proficiency-based method. The Japanese are LIGHT YEARS ahead. I think that task awaits people like you and John! You know it’s funny you mention that. The main reason I picked Taiwan was a memory I had of when our class went to the “China zone” in Arvada for lunch. I remember you told me before how you made three years of progress from your time in Taiwan. Unfortunately for me, Shida is a very, very different school now than it was when you were there. There are over 4,000 students, half of whom are Japanese. Each class has 10-12 students and there is no conversation and very little pronunciation correction in class. When I started studying at Shida, it had been a few years since my Chinese class with you and so I’d forgotten most of it. I started on chapter 15 of PAVC 1. Probably due to my previous background, I was the best student in my class in terms of speaking abilities in each semester and in the upper third in terms of 聽寫 grades. All in all, considering how many Japanese classmates I had to compete with, I was really pleased. But my progress was NOTHING like yours was. In three semesters, or almost nine months of study there, I got almost to the end of PAVC2下. Some of my classmates who started from chapter one had already been there for two years. To be honest I’m not sure how I’d do in a third year Chinese class at a top school like UCB even now. I decided to quit the school and work full time to save up the $20K(USD) it will take for a year of ICLP without working. From the ICLP students I’ve met, one year there is worth at least three at Shida. 1) The Taiwanese accent is a big problem. Most students here have a hard time differentiating between “ang” vs “an”, “eng” vs “en”, “ru” vs “lu”, “shi” vs “si”, “she” vs “se”, “shang” vs “sang”, and all the other similar 捲舌 problems. Even though I’m aware of the problem, I myself can never remember which words are supposed to be “shen” and which ones are supposed to be “sheng”. However, even with those “Taiwanisms” aside, more than half of my classmates had startlingly bad pronunciation. 2) Most of my Japanese classmates hung out exclusively with other Japanese people and me (a Japanese major). A lot of the other students including myself had Taiwanese friends, but those Taiwanese friends talked to us more in English than in Chinese. Sometimes it’s almost like it’s a fight to get people here to use their own language with me. Next time you’re in Taiwan, I’d love to buy you a drink swap Chinese learning stories! What does “ICLP” stand for? ICLP is the International Chinese Language Program. For many years the best Chinese langauge school was a program run by Stanford on Taida’s campus. It was called the “Inter-University Program” (IUP). The IUP moved to Beijing a few years ago, but the program in Taibei continued and was renamed to ICLP. ICLP is no longer run by Stanford, but it uses the same methods as it did before. Don’t confuse ICLP with Taida’s own program. Taida’s own program is similar to Shida’s. ICLP is by far the best program in Taiwan. I’ve known many people who studied at ICLP and went from knowing very little Chinese to being able to understand most of what’s on TV and most of what’s in newspapers within a year. As I said above, a year a ICLP is worth at least three years at Shida. Thanks for the info. I’ll pass it on to my boyfriend. I know that he wants to work right away, which is not compatable with such an intensive program. But as we might be in Taiwan for a long time, learning chinese quickly and properly would be an worthy investment. Especially in the light of the other post you wrote about the greater financial renumeration at HFRBs who only hire teachers who can communicate in Chinese. I am a Chinese doctor who is going to study a master degree as well as teach Chinese at the IWU. I was thinking of using IC. My concern is that it is only a 3 credit subject, and I am afraid that my students won’t be able to handle so many charactors. Also, does the CD pronounce like Mandrian or Taiwan? would you mind send me email to my mailbox as well? Oohh… I found that book really tough when I used in a five credit course. I’d say that unless your students already have some Chinese background, there’s no way you can do the whole book in one year. Maybe you could teach one lesson every two weeks, and cover half of the book in the first year. The pronunciation on the tapes is northern, not Taiwanese. if i can also have your email address, it will be great. I might have some more questions for you. Thank you again for your help. Please have a good day. Have u studied at ICLP in Taiwan? I suspect that how its different between ICLP in Taiwan and China? And, ICLP is the most expensive tuition fee (studying chinese) in the world? No, I haven’t. I studied at Shida. ICLP is probably the most expensive program in Taiwan, but there are definitely more expensive ones in China. This paper by Erik Harris about his experiences at IUP and ICLP might be useful for you. He’s a Blakemore Fellow who spent a year at each.